The Bookbinder’s Pliers. It securely holds commonly used bookbinding needles. 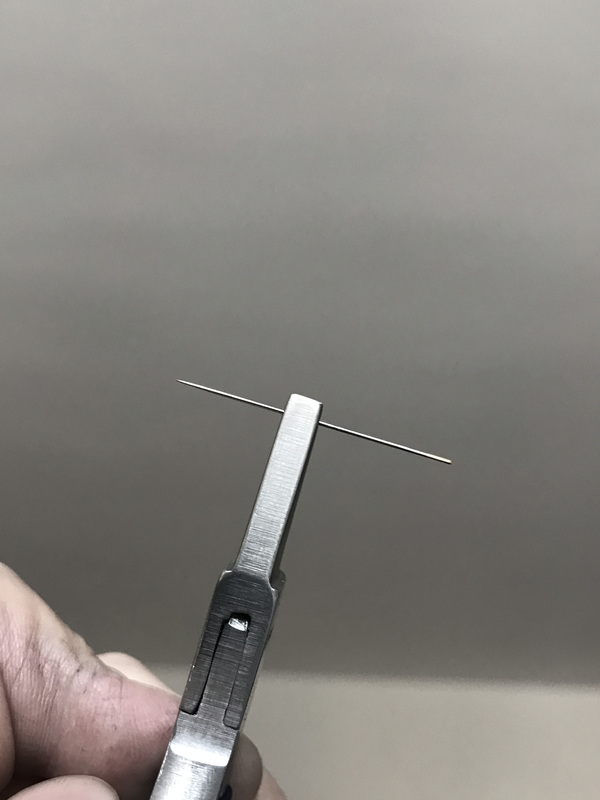 When sewing books or endbands, it is sometimes helpful to grip the needle with a pliers in order to position it or increase leverage. Standard pliers do not grip a needle securely, and the jaws are the wrong shape for these types of manipulations. Precise needle control is also essential in book conservation, for in-situ resewing of loose signatures, endband reinforcement, and various types of board reattachment. If you have ever had to pierce a parchment spine lining, you will likely understand the purpose of these pliers immediately. These pliers are also great for removing staples. The Bookbinder’s Pliers. 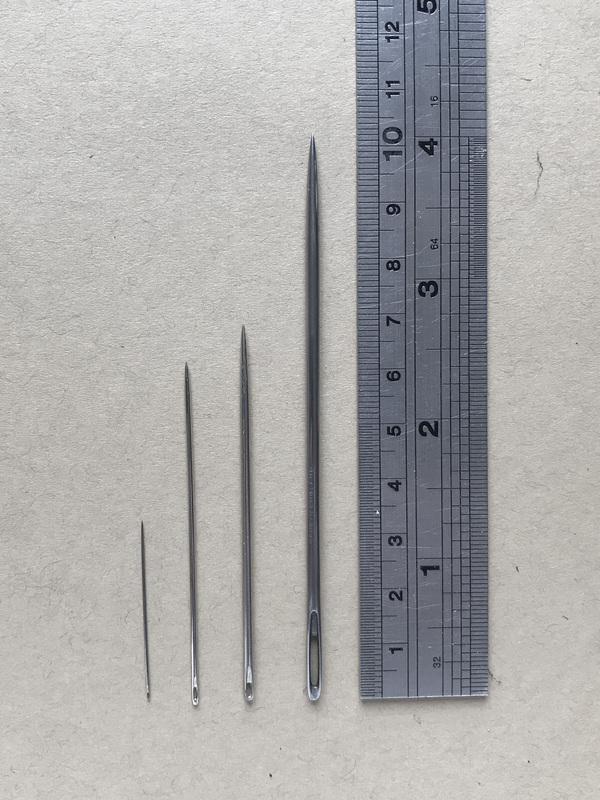 Fits needle sizes from 24 gauge (.020″) to 12 gauge (.104″) The massive 12 gauge needle on the right is an antique John James, labeled bookbinders needle. Possibly it was intended for sawn-in cords? The Bookbinder’s Pliers have a small groove cut near the tip, which securely grip needle sizes from 24 to 12 gauge. (.020″ – .104″) Note that 18 and 15 gauge needles are most common in bookbinding, though conservators may need smaller sizes for specialized tasks. The Bookbinder’s Pliers holding a 24 gauge needle. Tip: always sew with needles that have eyes the same size as the shaft to prevent an excessively large hole in the paper. The jaws are ground to .375″, which is wide enough to leverage and guide the needle through stubborn materials, but narrow enough to get close to the work. 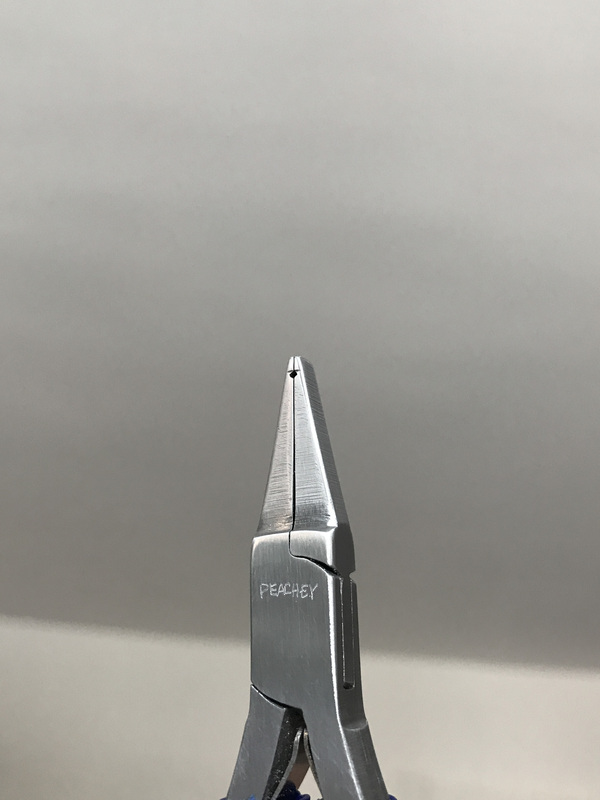 All edges of the pliers are rounded to prevent potential damage to the book and the user. 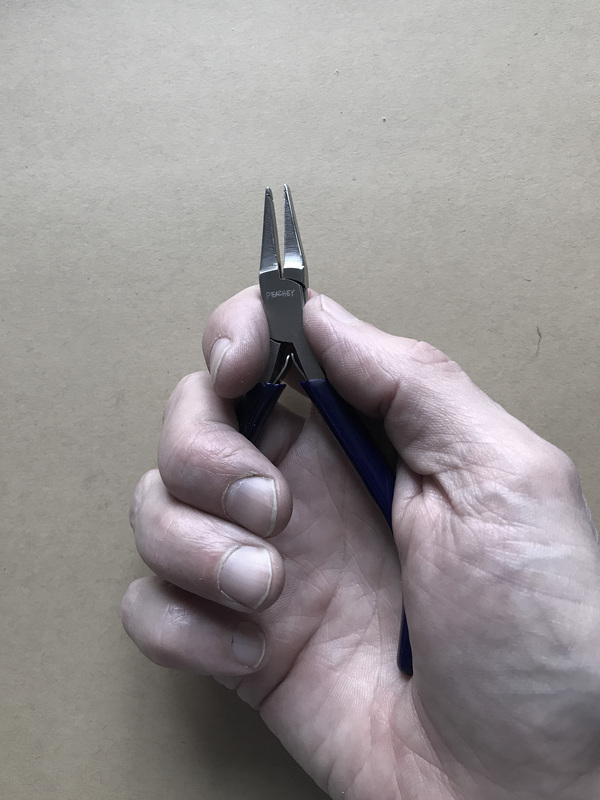 The Bookbinder’s Pliers fitting comfortably in the hand. Made of stainless steel, this precision tool fits comfortably in the hand. The pliers have a box joint to apply even pressure. About 4.5″ long. You will wonder how you ever worked without these. Purchase your Bookbinder’s Pliers here. This week I am guest blogging on the The Book and Paper Gathering, a site which delivers conservation information in a light-hearted, easy-to-digest manor. A conservation magazine, rather than a peer reviewed journal. It is well worth spending some time reviewing their previous posts. Exactly twice in my life I’ve seen a tool and immediately felt such a keen a desire to possess it that my secular observance of the eighth commandment was severely tested. Drooling over Robert Minte’s collection of Japanese hera at the Bodelian Library in 2010 was the first time. They were so elegant, simple, beautiful — perfect tools, I thought. It was the longest flight of my life back to New York City, my fingers itching to make some for myself. Over time, I learned more about bamboo, shaping bamboo, and continue to keep making them today. 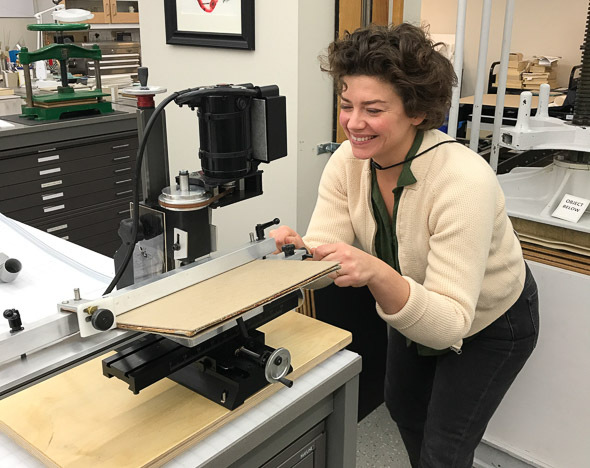 Jennifer Jarvis, Conservator in the John Hopkins Department of Conservation and Preservation, demonstrates how fun book conservation is using the Peachey Board Slotting Machine. 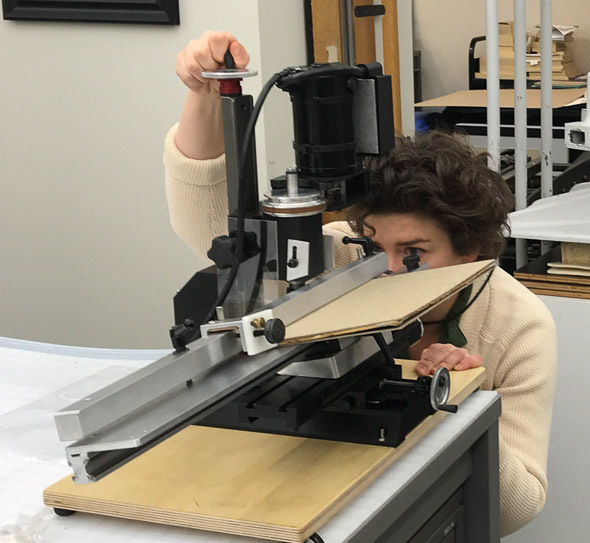 John Hopkins Department of Conservation and Preservation recently acquired a Peachey Board Slotting Machine as another technique in their book conservation arsenal to reattach detached boards. Detached boards are likely the most common place books fail. 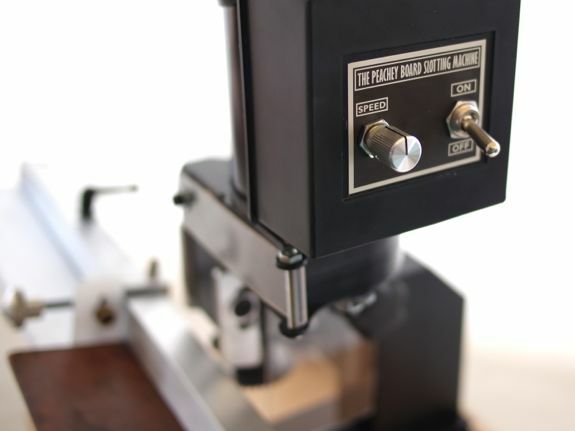 This machine accurately cuts a very small slot, as thin as .015″, to allow a hinge to be inserted without disturbing the covering material or obscuring evidence of lacing, board attachment, etc…. The machine is manually operated, and can accommodate boards up to a 18″ high. The start and stop of the slot is controlled by setting adjustable stops. No matter which side of the fence you are on regarding the use of leather in book conservation, board slotting with a cotton or linen hinge is a strong and durable base. The fabric can be left alone or colored with acrylics for fast repairs. Or board slotting can be combined with other treatments — such as tissue repairs, cast acrylic repairs, and leather onlays — to achieve a high degree of aesthetic integration. Board slotting is especially suited to nineteenth century leather bindings with a made hollow. More information on different structures for board slotting. Jennifer Jarvis aligning the height of the blade where it will begin making the slot. This is much easier on the new machine, since you can sight the length of the board from the end of the machine.